There’s always been a tradition of singing at football matches right from the beginning, and many of the tunes sung on terraces now (or what used to be terraces) are based on hymns and tunes that were sung over a hundred years ago. The advances in recording technology over the last century led to the proliferation of recorded songs and crowd songs that we have today. Songs such as ‘Oh When the Saints’, ‘Land of Hope and Glory’ and the mesmeric ‘In-gur-lernd, In-gur-lernd, In-gur-lern’, (repeat ad nauseum) formed the staple diet of crowd songs in days of yore but the genre really began to flourish as first the clubs and then the FA realised the financial potential of timely record releases. The 1966 World Cup was the first to suffer a severe attack of marketing with the introduction of the tournament mascot, World Cup Willie, a footballing cartoon lion. The country’s favourite skiffler, Lonnie Donnegan, released a song of the same name and thus had the first officially recognised World Cup song. It was for the World Cup as a whole though, not an England song. The FA first got into the act with ‘Back Home’ by the England Squad in 1970, which was prophetic, seeing as they were indeed very quickly back home. This followed the club trend of the time of getting the actual squad to sing the song, regardless of musical talent, and possibly shortsighted. Mercifully the next opportunity the FA had do this wasn’t until 1982, when England finally qualified for a World Cup again. This was the only positive aspect of a barren decade, but not having learnt from their mistakes the FA had the whole squad up there murdering the ominous title ‘This Time We’ll Get it Right’, which, of course, they didn’t. For 1990, the FA decided to hand the job over to the professionals and New Order produced ‘World in Motion’ this time with the help of just a select few members of the squad. Lyrics were by Keith Allen, the multi-talented actor and musician, who was to have a hand in many England songs over subsequent years. John Barnes’ notorious ‘rap’ has divided opinions over the years and sadly the binned tapes of Peter Beardsley and Paul Gascoigne’s attempts have not resurfaced. ‘World in Motion’ is recognised by many as one of the finest recorded England songs, but it wasn’t heard on the terraces a great deal. 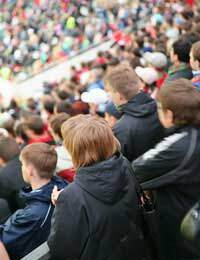 Songs popular on the terraces have to be simpler and more strident, and it was in 1990 that the ‘Dambusters’ theme began to emerge as an England crowd song. But the European Championships of 1996 were about to change all that. The legendary ‘Three Lions’ by the Lightening Seeds and the woefully tuneless comics Frank Skinner and David Baddiel is probably the best example of an official England song that crossed over into the crowds as well as being a massive chart success, both in 1996 and in 1998 with an updated version. Building on Baddiel and Skinner’s comic football TV chat shows it showcased many iconic England football moments (e.g. “that tackle by Moore” from 1970) and with a decent tune and snappy lyrics it appealed to many different age groups and could be sung en masse as well. There were many more unofficial England songs through the years and one from 1996 was ‘England’s Irie’ by Black Grape, a band born from the ashes of the Happy Monday with guests Joe Strummer and that man Keith Allen again. Another was Collapsed Lung’s ‘Eat My Goal’ which is still heard every week today on Sky’s Soccer AM every Saturday. Picking up on the popularity of burst eardrums on South American terraces, the 1998 World Cup in France saw the debut of the England Supporters Band, a loose ensemble of brass and percussion. Now officially recognised by the FA, they have appeared at every major tournament since and have driven the adoption of a number of now-classic England crowd songs, such as the theme from ‘The Great Escape’, ‘Rule Britannia’ and ‘Jerusalem’. The official England song for 1998 was the instantly forgettable ‘On Top of the World’ by England United, which featured member of Ocean Colour Scene, Space, Echo and the Bunnymen and the Spice Girls. It reached number 9 in the UK charts, but zero in the UK’s hearts. 1998 also saw chart success from Fat Les, a band fronted by, yes, Keith Allen, with the unofficial but iconic ‘Vindaloo’, which also crossed over into the crowd. The FA picked up on this and for Euro 2000 merged three things, a song the crowd had already adopted, the experience of Keith Allen, and the chart success of ‘Three Lions’ and engaged Fat Les to record ‘Jerusalem’ as the official song for the European Championship. Incidentally, he also wrote ‘On Me 'Ead, Son’ for the film Mike Bassett: England Manager’, released in 2001. The next few years were unremarkable, with odd couple Ant and Dec’s ‘On the Ball’, for the 2002 World Cup, disappearing without leaving much of a dent in the memory, and a complete cop-out for Euro 2004 with a re-hash of The Farm’s ‘All Together Now’. Not a bad song but it had already been used as an Everton song a couple of years before and was trotted out for 2004 as FIFA’s official song. The recent World Cup saw attempts by the FA to censor football songs. Sensitivities were heightened by the spectre of English fans singing ‘Ten German Bombers’ (to the tune of ‘Ten Green Bottles’) and ‘Two World Wars and One World Cup, doo-dah, doo-dah’ in the heart of Germany. This was both supported and condemned in equal measure across the country but in the end the tournament passed without too many Germans crying into their beer at English fans’ nasty witticisms. The team of course helped matters by playing like a load of overpaid egomaniacs and wibbling out early on. The official song was ‘World at Your Feet’ by Embrace, which sunk without trace; how many people outside of a pub quiz are going to remember that? More likely to stick in the memory is Sham’s 69’s reworking of ‘Hurry Up Harry’ as ‘Hurry Up England – the People’s Anthem’ which reached number 10 in the UK charts. Two items stick in the mind that reflect superbly the humour and anarchy of football crowds. The first is the gleeful acceptance by the England fans of the opportunity to chant, to the tune of ‘Guantanamera’, ‘Two Gary Stevens, there’s only two Gary Stevens etc’ at the 1986 World Cup, as Spurs’ Gary Andrew Stevens and Michael Gary Stevens of Everton were both in the squad. The second was the inexplicable choice to feature Welsh ‘rappers’ Goldie Lookin’ Chain and their ditty ‘Your Missus is a Nutter’, a song aimed at a certain Mr. David Beckham, in the pre-match entertainment before the England versus Wales World Cup Qualifier in Cardiff in 2005. As the ‘missus’ in question was actually in the audience at the time, supporting her husband, this heralded an indecent amount of back-pedalling all round by Welsh dignitaries.